This is an overview of each step of the lesson cycle. 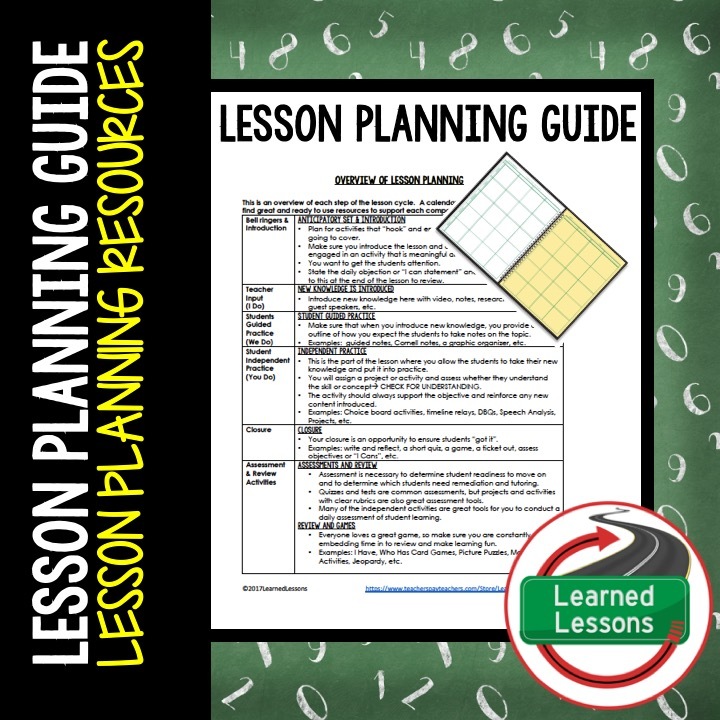 A calendar is included and a guide to find great and ready to use resources to support each component of the lesson cycle. · Plan for activities that “hook” and engage students in the topic you are going to cover. · Make sure you introduce the lesson and ensure that the students are engaged in an activity that is meaningful and fun. · You want to get the students attention. · State the daily objection or “I can statement” and ensure you come back to this at the end of the lesson to review. · Introduce new knowledge here with video, notes, research, presentation, guest speakers, etc. · Make sure that when you introduce new knowledge, you provide an outline of how you expect the students to take notes on the topic. · Examples: guided notes, Cornell notes, a graphic organizer, etc. · This is the part of the lesson where you allow the students to take their new knowledge and put it into practice. · You will assign a project or activity and assess whether they understand the skill or conceptà CHECK FOR UNDERSTANDING. · The activity should always support the objective and reinforce any new content introduced. · Examples: Choice board activities, timeline relays, DBQs, Speech Analysis, Projects, etc. · Your closure is an opportunity to ensure students “got it”. · Examples: write and reflect, a short quiz, a game, a ticket out, assess objectives or “I Cans”, etc. · Assessment is necessary to determine student readiness to move on and to determine which students need remediation and tutoring. · Quizzes and tests are common assessments, but projects and activities with clear rubrics are also great assessment tools. · Many of the independent activities are great tools for you to conduct a daily assessment of student learning. · Everyone loves a great game, so make sure you are constantly embedding time in to review and make learning fun. · Examples: I Have, Who Has Card Games, Picture Puzzles, Matching Activities, Jeopardy, etc. 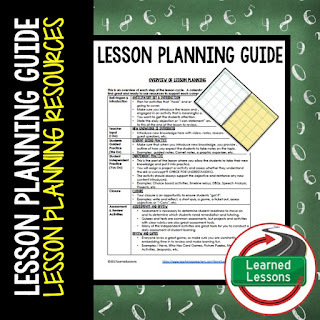 This is an overview of materials sold by Learned Lessons Teaching Resources. Many of these activities are included in bundles, so make sure you read the descriptions carefully to ensure you get the most for your money. CLICK ON LINKS TO SEE MATERIALS AVAILABLE. -Have a few word up each day for students to record in their vocabulary outlines. These pages should be kept and used to study and complete activities throughout the unit. -Create questions and give student copies or post around the classroom and have students answer questions from the charts. They could also be used as a closure or homework activity. -Print 2 or 4 to a page and post into interactive notebooks. I Can Student Self-Assessment of Mastery à Great for bell ringer review and to have student document the topic they are learning about, then review again at the end of the class to self-determine their level of mastery. These are also great with the included scavenger hunts to review content before a test. -Each day review a section of notes and have students used the guided notes packet to follow along. Students will have a complete packet of organized and easy to study notes and vocabulary at the end of the unit and to use throughout the unit in completing activities. -You could also print these 2 to a page for interactive notebook inserts. -Students can use these notes to follow along and actively participate during the “Teacher Input” section of the lesson. -Assign these as needed to support instruction daily or allow students to choose which activities to complete. -Paper and Digital Versions are provided for each unit. -Use these cards to engage students in sequencing historical events or scientific processes. These can be used in groups or individually. -Paper and Digital Versions are provided if included in unit. -Great for independent practice and assessment. -Create questions and give student copies or post around the classroom and students answer questions from the charts. They could also be used as a closure or homework activity. -These are great to use with the entire class as a review or daily during Guided Practice to review and drill vocabulary knowledge. -I suggest classes time themselves on how quickly they can put them in the correct order and try to beat their own time or another class or groups time throughout the unit. -Great for review or independent or group practice. Additional Activities by Learned Lessons that are included in some mega bundles and coming soon for others. THis is awesome for new teachers or even seasoned teachers. it is so comprehensive...Thanks for sharing! The details here are wonderful! Thank you!